First of all, what is the homogeneous definition chemistry? Homogeneously is Latin for "the same kind".we called the homogeneous substance if it contains only one type of compound or one element or uniform composition of the mixture. Many examples of homogeneous pure substances and compounds, such as metals, pure Ni, Al, Fe, Si,.... which contains the only one atom. On the other hand, the compounds which have more than elements like solid salts NaOH, NaCl, ....and so on, or liquid solutions like water, HCl. 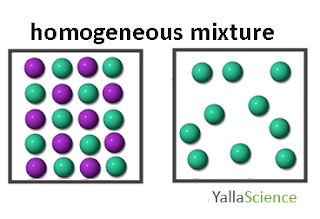 Now, we know what is homogenous in chemistry, but Which is a homogeneous mixture? In other words, the homogeneous mixture is defined as a combination of two or more pure chemical substances in which the original substances retain their chemical properties. 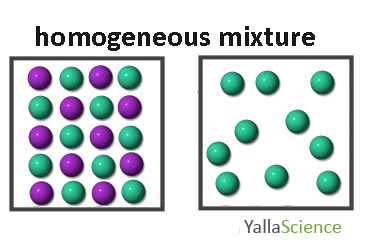 Many students ask us, which is an example of a homogeneous mixture? we answer this question in the next paragraph. Actually, the solution is a type of mixture, but we can say solution on a mixed of salt with water, we can't say the solution on a mixed of salts or different liquids. On the other hand, now, you are able to know what the homogeneous mixture meaning.